The V-Screen is RealView Innovations Ltd.'s pioneering new games accessory, created specifically for the Sony PSP games console. Featuring patented 'Depth Enhancing Screen Technology,' the V-Screen makes any PSP game look and feel far more realistic and exciting. It is particularly effective on racing and platform games as users are drawn into a faster and more exhilarating experiential adventure. In addition, many of the fine details show up far better on the screen which means scores are likely to improve. 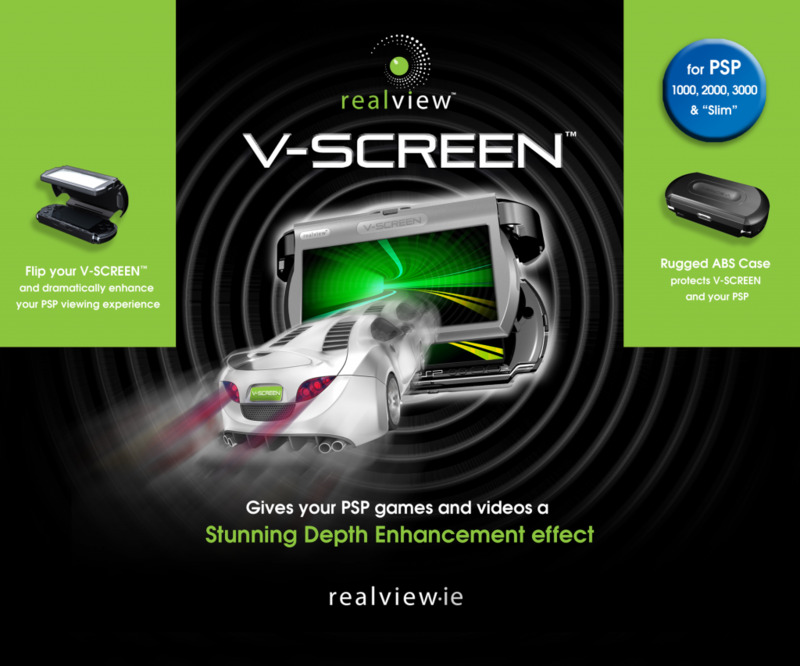 V-Screen combines RealView's unique optical technology with a sturdy case that will have the added benefit of protecting your PSP. A light, portable and consumer-friendly attachment, the V-Screen is flexible enough to accommodate the PSP 1000, 2000 and 3000 series and is a 'must buy' accessory for any gaming fan. The V-Screen is sure to breathe new life into all your new and old PSP titles.